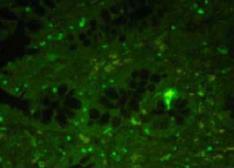 Specificity/Sensitivity: This antibody binds human PYY. Cross-reactivity with NPY or PP in solution is <0.1%. 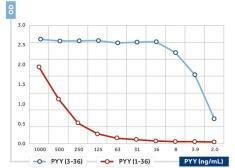 Specificity/Sensitivity: This antibody is specific for Peptide YY (PYY). Specificity/Sensitivity: Peptide tyrosine-tyrosine amide (3-36), or PYY(3-36), is a major metabolite of the gut hormone PYY and is produced by the action of dipeptidyl peptidase IV on PYY in the intestinal brush border and in the circulation. PYY(3-36) is a potent inhibitor of food intake in rats and humans, acting selectively on the Y2 receptor to inhibit orexigenic NPY neurons in the arcuate nucleus, thus disinhibiting anorexigenic POMC neurons. The anorexigenic effect of PYY(3-36) is additive to that of the co-secreted gut hormone GLP-1.